For five days from November 12th through 16th 2018, Hiroshima University (HU) dispatched Ms. Seiko Fujii to Malmo University (Sweden) under the INU Staff Shadowing Program (*). Ms. Fujii is a staff member of the Student Support Group, Kasumi Campus Management Support Office of HU. Ms. Fujii is in charge of the graduate program in the Student Support Group. At the Shadowing Program, she had briefings and exchanged views on the implementation of entrance examination, student recruitment, student support system, etc. 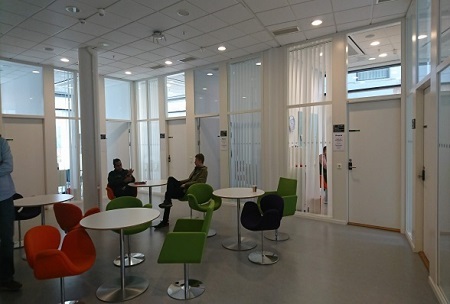 First, Student Center Director gave a brief explanation about Malmo University, and then Ms. Fujii had discussions with staff of Malmo University responsible for all affairs concerning student support. So far, HU has dispatched ten staff members to foreign institutions while hosting eight persons from overseas countries. This program aims to strengthen ties among the INU (International Network of Universities) member universities and to promote internationalization by providing the opportunity for administrative staff to study, discuss, and compare administration and governance systems across the network. Participants will normally spend one or two weeks with one or two different INU partners.